There are two parts of the horse's anatomy that have evolved to withstand constant wear: the teeth and the hooves. Due to the way horses use their teeth to grind fibrous roughage to optimize its digestion, they are submitted to a slight but continual wear. To counter this, and make sure they last the horse's lifetime, the teeth slowly erupt from the jaw - this means that they are not actually growing, but the tooth that is already present in the jaw is gradually pushing up to replace the wear. Following a similar principle, the horse's hoof wall grows continually (along with the sole, frog etc. ), in order to replace the wear brought about by the continual movement that is natural for horses. These changing parts of the horse's anatomy have the particularity that they must be hard enough to perform their function, and flexible enough to adapt to changes in the environment and in the structures that support them. These properties are also at the root of how any distortion of form in these changing parts can become highly problematic for the whole horse. It is this point that we want to talk about in this newsletter: the two-way relationship between the changing part of the anatomy (e.g. hoof wall or teeth) and the structures in the body that the 'flexible' parts both influence and are influenced by. On one hand the structure (the rest of the body) relies on the growing parts, for example the hooves, for the function they perform (contacting the ground) and at the same time, the growing part relies on the correct support of the structure to keep it wearing in the right way. The wear is really the key pivot-point in this dynamic - if the wear is both at the right rate and balanced, then a positive circle is set in motion whereby both sides of the equation can support good function of the whole body. However, what tends to happen is that that two factors come into play which upset this reciprocal relationship - one working from the inside-out, and the other from the outside-in. This is the principle that the innate unevenness of the horse's structure (their natural crookedness) becomes manifest in the changing part, as it takes up the pattern in its wear. 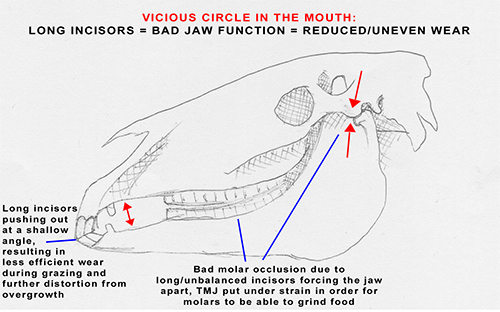 The way this comes about in the teeth is that the horse prefers to chew on one side of the mouth rather than the other, wearing one side of the molars more. Our studies have shown that there is a strong link between this preference and the horse's natural crookedness pattern (see The Whole Horse edition Equine Dentistry Effects). This uneven wear pattern also becomes manifest in the horse's incisors, which, being at the end of the long hinge-like apparatus of the jaw, are highly influential on the balance of the horse's temperomandibular joint - which has knock-on effects on the whole body and the functioning of the nervous system. 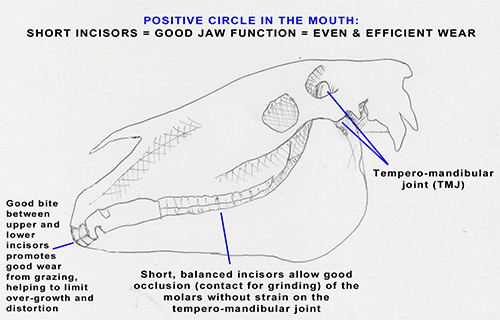 This is how the overall unevenness of the horse manifests in the teeth - the changing part - which, in a negative circle, then support and even aggravate the crookedness of the overall structures of the horses body. The crookedness of the horse's body also becomes manifest in the hooves as imbalance and distortion of their form. One common example of this is 'steep foot/flat foot syndrome', where one of the hooves is more upright (sometimes called a club foot) and the other is more flat and flared. Other ways that the hooves can take up the unevenness of the structures are in imbalances of the hoof caused by twists in the limb (even subtle ones) which cause the hoof to contact the ground unevenly, leading to uneven wear and the resulting distortion of the hoof capsule. The horse's way of moving can also cause uneven wear. This uneven wear of the hoof wall gradually changes the whole form of the hoof, causing distortion of all its tissues and eventually the inner structures too. In the same way as with the teeth, therefore, the uneven structure has influenced the changing part, which in turn exacerbates the unevenness of the whole body. The second factor which upsets the two-way balance of the structures and the changing parts is insufficient wear of the changing part. Whereas the previous factor involved the inner structure influencing the changing part, here the imbalance is initiated by environmental conditions, because it is the environment which regulates the wear. In hooves, there are three major factors which contribute to overgrowth - one is lack of sufficient contact with the ground, and the other is an unnatural diet, high in sugar and low in roughage, which makes the hoof wall grow quicker, and also damages the sensitive laminae of the hooves. The laminae are, effectively, the 'glue' that holds the hoof wall on to the inner tissues, keeping it in the right shape. The lack of sufficient contact with the ground is created by the way horses are kept conventionally - firstly that they are so often shod, which obviously prevents any wear of the hoof from the ground, and secondly, that their movement is so severely confined - long periods of time spent in stables, or small paddocks. Even the traditional turn-out environment of fields is not conducive to horses moving, as there is little motivation for them to do so. This fact is proven by the increased amount horses move around when they are given an alternative solution to fields, i.e. the lane system of the Paddock Paradise concept (see: Our PaddockParadise). 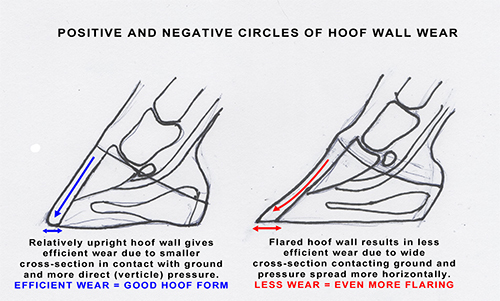 The reason that this insufficient wear sets up a negative circle is that when the hoof wall grows too long, it distorts and flares - i.e. it spreads out instead of growing down at the right angle. This means that the hoof wall starts to contact the ground at a shallower angle, resulting in a contact with the ground that is both less direct (the pressure on the wall is not so vertical) and over a wider cross-section of the hoof wall. These factors mean that the contact that does take place with the ground results in less wear when the hoof is already too long, only aggravating the problem for the hoof that is, by nature, growing continually. For the teeth, there is a similar negative cycle created by the basic problem of tooth eruption overtaking wear. This is also strongly linked to environmental factors - the more the horse has a natural diet with a high roughage content (hay/mature grass), the more they will be continually grinding the teeth against each other and wearing them down. To provide such a healthy diet for domesticated horses, we are obliged to feed hay as opposed to grass. This is because grass is too rich in sugar in most inhabited parts of the world, especially when we restrict the area of land that is grazed, and the grass is continually regrowing. The problem with the hay diet, however, is that the incisors are not used in the same way when the horse eats hay as they are for biting off the dry, rough grass that the horse - native to the Asian steppes - has evolved over millennia to eat. This is probably part of the reason that domesticated horses (especially those with limited grazing and/or a mainly hay diet) often develop overgrown incisors, along with the changes that selective breeding has made to the jaw conformation of domesticated horses. Even if a horse is lucky enough to receive regular dentistry to address overgrowth and imbalances, many dentists do not touch the incisors at all. In fact, 'floating' the molars without balancing overgrown or slanted incisors actually increases the imbalance of the whole jaw, and puts more strain on the TMJ. Similarly to the hoof wall, when the incisors grow too long, the whole mouth is put under strain, as the extra length means that the horse has to force the tempero-mandibular joint more to make the molars meet in order to grind food. This situation is actually worsened by rasping only the molars and not the incisors. When the teeth are not functioning smoothly, the wear is bound to be less, and therefore even less able to keep up with the continual eruption of the teeth. The Solution: The Positive Circle of Sufficient Wear - Healthy Function. So what is the best way to encourage a healthy balance between the growing parts of the horse, and the structure, that both depend on their function and influence them? From all of the negative circles described above, we can deduce that the answer to creating the positive circle instead lies in promoting optimal function though encouraging sufficient wear, which in turn supports the optimal function, and so the process goes on. This involves both addressing the horse's lifestyle to promote wear and limit overgrowth, and intervening in the right way to address any overgrowth and imbalance which has become established. For the teeth and the feet, this intervention takes the form of periodic holistic dentistry, and regular natural hoof trimming. The nature of the positive circle is such that the longer the balance of good function and wear is in place, the less intervention will be necessary, because a process of self-maintenance is initiated. For example, when the horse's hooves have developed distortion in both the hoof wall form, and the inner structures, they need more regular trimming, as efficient wear through the horse's movement is not promoted. The tissues which maintain the integrity of the hoof, such as the laminae, are also compromised in their function, leading to flaring of the hoof wall. 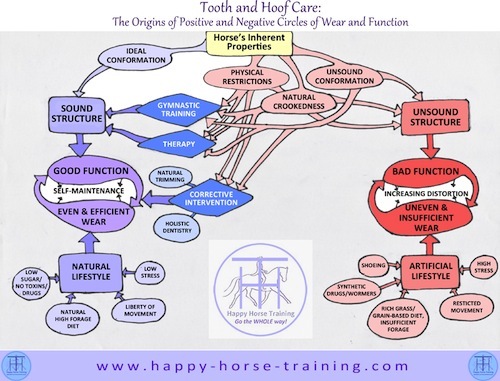 Obviously, the horse's teeth do not require such frequent intervention as the hooves, but the same principles apply - more correction is needed when the healthy balance of function and wear has been lost. The importance with the teeth is that the corrective dentistry employs a holistic approach which addresses the balance of the whole mouth, including, imperatively, the incisors. Due to their position in the mouth, at the end of the long hinge-like structure of the jaw, an overgrowth of even a few millimeters, and even a slight slanting of the wear, can have major implications on the whole function of the mouth. Through the incisors' influence on the TMJ, this can also cause disruptions to the horse's whole-body function and movement. This may sound far-fetched, but we have directly experienced the huge difference incisor correction can make to the horse's body through the improvement it makes in their gymnastic training. Again, the more natural integrity of structure (good conformation), health, and natural lifestyle a horse possesses, the more the mouth will stay in balance itself through healthy wear. Equally, once a distorted mouth has been balanced in a holistic way over several years, it will start to maintain its own balance, and may start to need only supervision by the dentist. We have already seen this come about with some of our horses, even though our dentist has relatively recently discovered a holistic approach to the mouth. Of course, with both the feet and the mouth, sound gymnastic training which addresses the horse's natural crookedness has a profoundly positive influence on the function of the teeth and feet. The balance we've talked about in terms of the feet and teeth of the supporting structure with the 'flexible' changing part has a strong parallel with the horse's movement. This can help us understand more clearly what we are feeling when riding a horse, and what we are trying to achieve through gymnastic training. In terms of the horse in movement, the structure can be thought of as the horse's body mass, supported by the postural muscle system which maintains its integrity in motion. The changing or flexible part is the limbs and the articulation of the joints which dictate their interaction with the ground. The relevance of looking at the horse's movement in this way is that it allows us to understand the dynamic between the nature of the horse's body mass, and way the limbs react to this in order to maintain balance. In the same 2-way relationship as exists between the horse's structure and the feet and teeth, the body mass depends on the function of the limbs to maintain balance, but it also influences their performance, so that the changing part also depends on the right support of the structure to be able to carry out optimal function. When horse's body mass is formed into the right lateral alignment with the direction of movement, and takes on the right longitudinal balance, the limbs are able to step in the trajectory which supports this structure in movement. For example, when traveling on a bend, if the horse's body is flexed accordingly onto the bend, the limbs will step on a curved trajectory, in alignment with the bend of the body mass. This support, via the contact with the ground, allows the horse to relax certain muscles, and dedicate more energy to power of transmission and postural engagement. It is the difference between the effort required to carry a centered load, and the strain of carrying an unbalanced load. When the horse's body mass is misaligned with the direction of movement, and unbalanced (e.g. on the forehand) the limbs are obliged to work on misaligned trajectories in order to maintain a certain level of balance. This puts strain on the limbs and articulations, and is, in itself, an obstacle to the alignment of the body mass - a negative circle just like those described above for the feet and teeth. 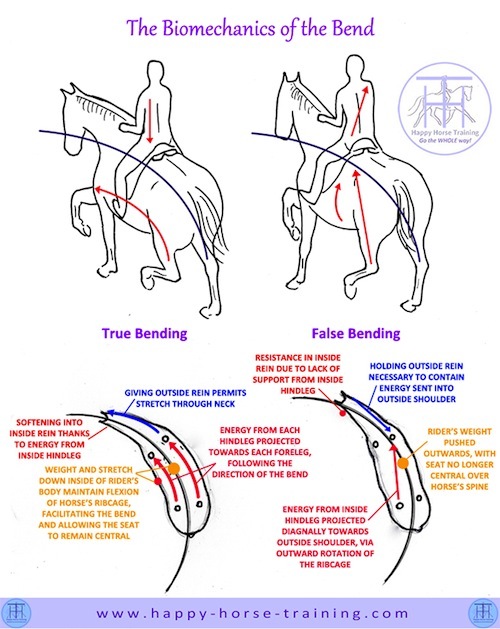 This is why the solution to creating balance in the horse's movement is not to obsess over where the horse is putting their feet, because unless the horse's structure is brought into alignment and balance (postural engagement) it is futile to try to change the trajectory of the limbs. 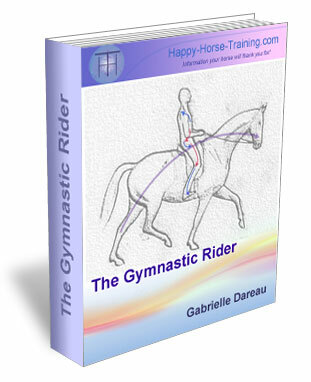 The rider must use their postural connection with the horse, and their aiding, to form the horse's body into alignment and bring about postural re-balancing, then the limbs will start to work in alignment automatically. 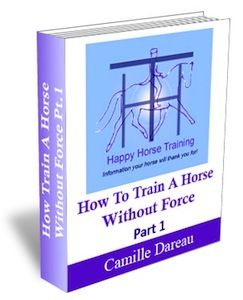 The exercises the rider then asks of the horse, on the basis of the aligned structure (not by sacrificing it) will further supple the joints, and render them able to provide more support to the body mass, which can then assume more collection. For example in a shoulder-in, when the rider has succeeded in bending the horse's body correctly, and then asking for the sideways yielding, the inside hind must step further under the body mass, slightly lengthening the carrying phase of the stride, and the outside hindleg must step out from under the body mass, increasing slightly the pushing phase of each step. These extra demands, performed on both reins (in both directions) strengthen and supple the joints and limbs. When the body mass has this extra support, postural engagement is promoted, and thus strengthens, which in turn supports the limbs, taking the strain of imbalance and uncoordinated movement off them. It is actually the continuity of postural engagement 'on the ring', that permits continuity of transmission similar to that created by a continuous rolling wheel, even though the limbs are not pushing off the ground continuously as a wheel does. 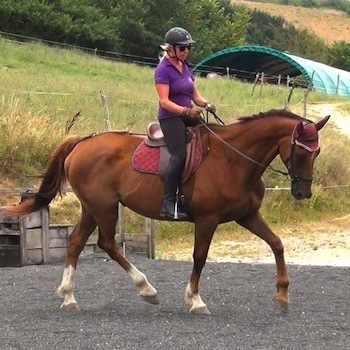 After an eventing career which left him with compromising damage in his joints, this horse has come back to soundness through a combination of a natural lifestyle, Cranio-sacral therapy and gymnastic training based on postural engagement. Working in this way helps him to build the postural support for the movement in his body structure, which allows his joints to become supple without the strain of having to compensate for a misaligned body mass and rider. This way, movement starts to actually benefit his joints, instead of breaking them down.